Random Anny .Com: Shopping for vintage items? There's an app for that! Shopping for vintage items? There's an app for that! Browsing the web for hours has always been a key part of the experience when shopping for vintage items. There’s a section for vintage items on eBay and Etsy, but up until recently, there hasn’t been many apps that are dedicated to bringing in the top sellers of vintage items for bargain hunters who are looking for something rare and unique. 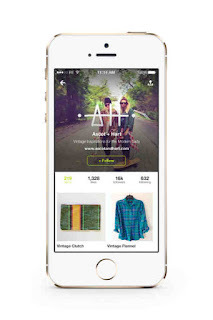 Reissued is an app that aims to bring together buyers and sellers of vintage items. With it, there’s no need to browse through hundreds of sites just to find the vintage items you’re looking for, as it “cuts through the noise of eBay and Etsy.” The app is technically like a modified Instagram where people can shop for vintage furniture, music, art, clothes, accessories, porcelain, and many others interesting relics. Some of the top vendors of the app include Decades, and OneFortyThree. Top vendors aren’t the only ones who are allowed to sell on Reissued. Private sellers are welcome, too, and one of the best things about the app is that there are no listing fees unlike some online trading sites. All users have to do is to take a photo of the item they’re selling, set a price, and it’s good to go! Apart from the fact that users can browse a lot of vintage stuff using the app, people will are also able to get updates straight from their favorite sellers. New items are being added on a daily basis so there’s always something new to look forward to on Reissued. In the past, only websites such as eBay and Etsy gave access to peer-to-peer trading. Now, thanks to the advent of smartphones, people can easily browse, buy, and sell vintage items via their smartphones. There seems to be no end in sight for the mobile industry’s success, and, according to Gaming Realms -- the company that develops and hosts original gaming titles through Spin Genie -- mobile sales will skyrocket to over $40 billion by the end of 2015. With such huge potential, consumers should expect many more apps in the future similar to Reissued to cater for their vintage needs.